A necessary part of the mainstream author's life, especially of non-fiction, is that they have to promote themselves by writing articles about how they wrote the book that is just being published. Johann Hari promoting his new book about drug addiction. Robert Macfarlane promoting his new book about landscape words. I am reading Macfarlane's earlier book The Wild Places at the moment. It's often a really good book however undisguisedly a book written to the non-fiction formula of today.One of the best things about it is the studied deployment of the enhanced vocabulary that his new book centres on. But I haven't got time to think about the winter night on Ben Hope now, nor the holloways of Dorset. The promotional-article-about-the-book, as evinced by the above, is also a genre with its own formula. For example, all those sentences that say "I did this interesting thing, I did that other interesting thing, while in still another interesting place I was emotionally stirred by hugely interesting things that I go on about in the book." At the same time, in this internet world where all digitized products tend to become free, there's an awareness that the article will get more readers than the book itself, and accordingly it had better contain the heart of what the author would like us to know. Because there are too many books, and we can't read any but a tiny fraction with the attention that they deserve and that all book-lovers would love to give but can't, it's a sensible faute-de-mieux to rely largely on these digests to gain a literate and informed view of what's going on in the world. Many of my clever colleagues in IT read no books at all; they have already forgotten Robert MacFarlane's name, but they remember something about the remarkable words for specific states of rain and ice; not the words themselves, but the fact that they existed. So instead here's a link, to the online PDF of Catherine Daly's Controller / Seedbed , which came out in June 2014 (I think, her first book for about seven years). Somewhere between the monumental savageries of Saxo's story of Amleth and John Marston's Antonio's Revenge comes a play called Hamlet. Revenge plays, prior to Hamlet (and after, too) had tended to be violent, rhetorical gorefests. But when we think about Hamlet it always comes as something of a surprise to look back on the final scene and find it studded with corpses. Everyone seemed so normal! For the ordinary soldiers in the opening scene, taking note of the ghost's alarming appearance, Horatio speaks their thoughts: "This bodes some strange eruption to our state". No-one at that point sees fit to connect the eruption with the recent change of ruler or with the questionable marriage of Claudius to his dead brother's wife that is taking place concurrently. Their interest as commoners is more taken up with the clear preparations for war, including the heightened state of watchfulness in which they participate. The super-abundant richness of Shakespeare's realization of the Danish court is a matter of people behaving ordinarily. The family scene with Laertes, Ophelia and Polonius is a good example. Guildenstern, Hamlet, Polonius, Ophelia and Gertrude make unexceptionable conversation about the players and the play they perform. Their remarks are not out of character, but also not narrowly related to the roles these speakers play in the drama (Gertrude's apart, perhaps). A year or two after Hamlet had already been successfully performed, Shakespeare seems to have inserted a highly topical discussion of the children's companies (Harold Jenkins gives the details). 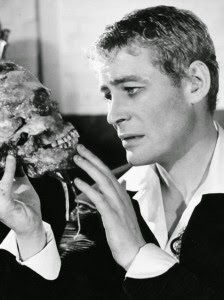 In this passage Rosencrantz provides the lively satire, and Hamlet is the casually interested questioner; the tensions between these two characters seem to be put on hold; they can lay them aside and just be ordinary people again. And there's nothing jarring about this - in the world of Hamlet such non-sequitur is characteristic and convincingly naturalistic. It's difficult to imagine any other play, even of Shakespeare's, being so capacious as to allow this. But here everyone, good or bad or mixture of both, can behave in an ordinary way. The original title is Fänrik Ståls Sägner – Ensign Stål is the supposed originator rather than the hero. His voice is not often heard, but his shade hangs over the ballad-poems – a figure of undaunted resolve in age. Johan Ludvig Runeberg was born in 1804 and died in 1877. 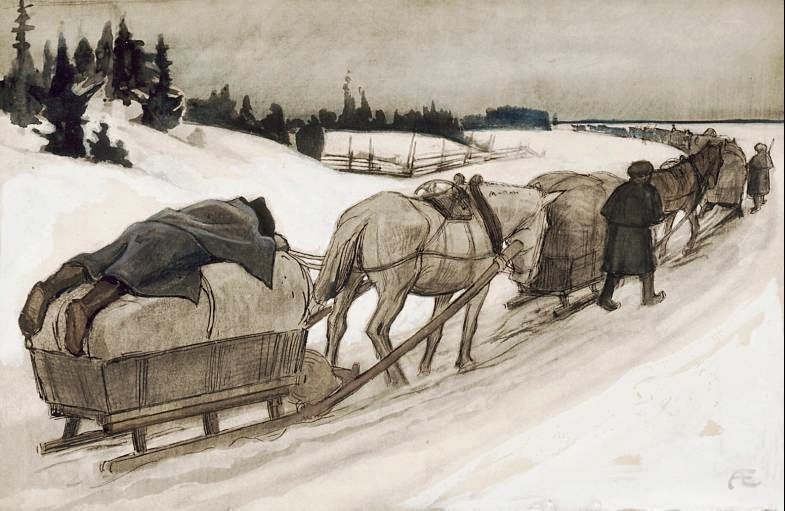 He was only a small child in 1808 when the Czar suddenly declared for Napoleon and, since Sweden was now his enemy, invaded Finland without warning. (Finland had for six hundred years been loosely united to Sweden). The Finns defended heroically but they had been taken by surprise; the Swedish king was not helpful and the war ended in subjection to Russia. This war of 1808-1809 is the subject of Ensign Stål. I could have kissed each page I read. From those thou gav’st but bark to eat! Patriotism in most countries involves some recognition of the beauty of one’s land (“England’s green and pleasant land”), but in Sweden and Finland the beauty is more intensely experienced. It is omnipresent and has a certain uniformity: the largely poor, acidic soils, and the long winters see to that. There is no rank overgrowth, and birch by a wooden shack by a lake is an extremely sparse symbol that evokes everything. 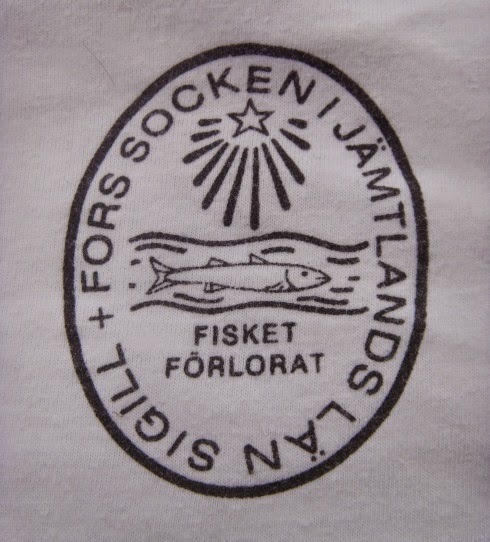 This is the seal of Fors parish, the easternmost parish in Jämtland. The name "Fors" referred, no doubt, to the mighty waterfall Storforsen on the Indal river. The motto "Fisket förlorat" (the lost fishery) was coined at the beginning of the nineteenth century, in the immediate aftermath of Vild-Hussens inadvertent destruction of Storforsen. The salmon fishing at Fors was famous and had been economically important. After the reformation, the crown took over control of the fishing rights from the church, and there were quite a number of lawsuits with local bondsmen.